Yes, I’d love to go there—stalactites in caves, old cemeteries and wolves, darkness and bats. The castle. I’m on a long, cobbled walkway stretching up a semi-steep hill. Ahead of me stands a castle, big but not huge, old but not asleep; voices can be heard from inside—tourists, like us. A few yards farther and I will have reached the sand-coloured staircase leading to its entrance. But I can’t make my legs move. I can only stare at the towering thing and shield my eyes from the sun backlighting the structure’s stone walls and red-capped peaks. My girlfriend, V, also has her neck craned, and her camera is clicking from on top of her face. We stand with our heads back and eyes up, throats exposed like offerings to the infamous Count himself. We are seconds from entering Bran Castle. Or, more notably, Dracula’s Castle—the castle, it is said, that inspired and shaped the one fictionalized by Bram Stoker in his 1897 gothic tale of love and terror. “You ready?” she asks, knowing well enough the answer. Struggling with words, I nod. She knows how much this means to me and, always considerate, lets me ascend the staircase first. A giant wooden door is open. We step inside. I’m visualizing the valleys of forest before she finishes the question; those saw-toothed mountains, the tiny villages. I’ve always wanted to go. Vampires have strolled in the cosmos of my darkest nightmares since I grew my first set of canines. I’ve read Dracula and seen the inspired films more times than I can count. Yes, I’d love to go there—stalactites in caves, old cemeteries and wolves, darkness and bats. The castle. “Transylvania. Without a doubt,” I say. We stand with our heads back and eyes up, throats exposed like offerings to the infamous Count himself. Vampires have strolled in the cosmos of my darkest nightmares since I grew my first set of canines. V sips her beer—Ciuc, it’s called, a Romanian brew in a green bottle. She chuckles when I try to pronounce it: See-yuk. During the week, we’ll have our fair share of See-yuks, as well as a good laugh when a native corrects my butchered pronunciation. Me, I’m drinking an Ursus, a brew in a gold can branded with a crown-wearing bear. If bears are royalty, why does a six-pack cost me just six dollars Canadian? I don’t ever want to go home. Brasov is a picture of a picture, so perfect it’s doubly surreal, a place whose likeness you might discover in an illustrated fairy-tale book your grandmother once kept as a child. We’re seated at one of many tables on a patio strip off the town square, the one snapshotted onto countless European postcards; the one where little girls startle flocks of pigeons into chaotic flight. This one is ringed with medieval rooftops and century-old lookout towers. Behind the houses and bastions, and overlooking the city like a slumbering Quasimodo, is Tampa mountain, a hiccup in elevation—small, that is, in comparison to much of the Carpathian landscape. From here, however, the green-tipped mountain is colossal. No sign of Count Dracula yet. Nor have I seen any bats or wolves since we’ve arrived in Romania. Across the street, however, a gypsy-lady leans with her arm up against a storefront. I try not to stare for fear of making eye contact. And down the road is Pizza Strega. “Strega” means “witch” in Romanian. I know this by the image of a cartoon witch straddling a pizza-broomstick hybrid and flying over flames in front of the moon. No, no Dracula yet, but we’re getting there. The cab driver is nice—a young guy, all teeth—but we’ve been told to be wary of drivers trying to overcharge. I make sure the meter is on. “Autogara 2,” I say. Brasov isn’t large, but for some reason there are two bus stations. I picture the second to be a bizarre, black market-type assembly of ride-shares. He nods his curly haired head and we depart. Bran Castle is in Bran, a village 40 minutes south of Brasov by bus. The sun is out, we’ve got our packs with snacks, and as we drive to the station I’m thinking of Bela Lugosi and his unravelling fingers. The quaint buildings and flower stands begin to dissipate as we make our way out of the old town. They’re replaced by communist-era, concrete apartment blocks speckling a now-desolate stretch of the city. Everything looks dull, barren, the picture-book aesthetic drained. I wonder where this man is taking us. Maybe he delivers groceries for vampires. I put a hand on my girlfriend’s thigh. I look at her beside me. We may be going to a lonely place, but I’ve never been so far from alone. No, no Dracula yet, but we’re getting there. At the station, the man behind the booth jabs a finger at the bus schedule. Again, he shoves a hairy finger at the sheet taped to the Plexiglas between us. “Bran? Bus tickets for one o’clock, please. Can we buy them here? Where can we—” I can see his irritated face getting redder as I speak, and I’m concerned for the first time about the language barrier; I’ll be damned if we don’t get a ticket for that bus. I’ll walk to the castle if I have to, though I’ll likely evaporate under the sun before I reach it, or go up in flames like some careless bloodsucker out past dawn. “Over there maybe?” V points to a small building across the lot. She hangs back as I open the door to the unmarked, shed-like building. Sunlight files into a dark room and illuminates a sheet of smoke, like high beams lighting up fog on a road at night. A dozen figures hunched over slot machines turn their heads my way, squinting behind ropes of lifting cigarette smoke. Gamblers. I shut the door, wondering if there is any difference between these folks and the folkloric figures I’m so obsessed with; both feed off something, after all. She’s already noticed the yellow coach pulling in and calls me over. The destinations are printed on the window: Brasov. Rasnov. Bran. Relief. We board the bus, pay the driver (a sweaty John Goodman doppelganger), and take our seats. She looks at me and makes the “motion of the fang,” our nerd-heavy vampire salute: pinkie and index fingers brought to the canines and pulled down as if to extend the teeth. I put my arm around her, and as the bus takes off I’m surprised to hear Roy Orbison, one of my all-time favourite voices, come over the radio singing “Only the Lonely.” I look at her beside me. We may be going to a lonely place, but I’ve never been so far from alone. I’m managing my disappointment within moments of exiting the bus; it starts off small, a pinprick of light piercing the darkness I’ve so passionately conjured for the occasion. I look at the castle through criss-crossing telephone wires. It’s a beautiful beast, but only half resembles the fortress described by Stoker in his novel. It sits on the edge of a rock precipice, yes, but only a few hundred feet above ground level, not a thousand. And it’s not as large as I had hoped. Still, I can’t deny its wonder. I try to imagine it at night. I picture the cars driving by as if they are carriages led by horses with cloaked, shadowy drivers at their reins. The selfie-stick-toting packs of tourists are wolves—Listen to them, the children of the night. What music they make! I am Jonathan Harker, Stoker’s young protagonist, soon to be doomed to imprisonment in the castle. I’m concerned for the first time about the language barrier. A sweet ripple of fear crawls over her face as she peers up at him. V’s hand finds mine and I’m me again, still dissatisfied. We march toward the village centre and, upon approach, the pinhole of discontent grows. The walkway toward the castle is padded with kitschy vendor stalls selling not only an abundance of cheap Dracula novelties such as postcards, mugs, and t-shirts, but Mickey Mouse and Hello Kitty dolls as well. Leave it to a stuffed pink cat to really chew up the mood. Nevertheless, it’s a beautiful day, the scenery is gorgeous, and I’m in the best company I could ask for, so I dress the scrape on my heart and we carry on up the walkway (though I do cave and buy a fridge magnet—when in Romania). 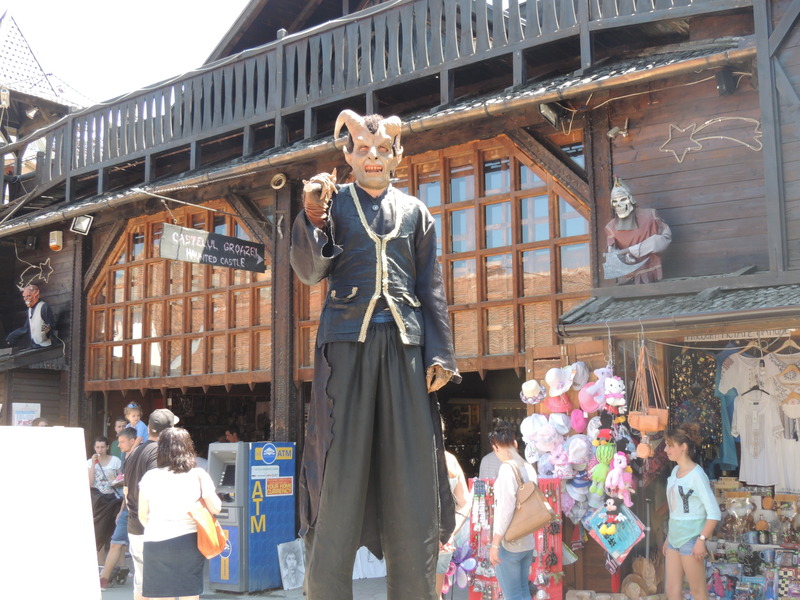 We’re met by a horned ghoul—a man in costume on stilts—dressed in all black and standing no less than 10 feet high. He looks like he could be one of Dracula’s grounds men, if the Count weren’t so dedicated to isolation. “Go grab a picture with him!” I say to her. He’s wielding a long, blunt baton and holds it to her head as she poses, looking miniature, beside him. A sweet ripple of fear crawls over her face as she peers up at him. The atmosphere is restored. Inside, we find no grand spiralling staircase, no vaults, no old, ruined chapel. Save for one, we find no secret passages, no heavy chains at the entrance, no coffins, or piles of dust. We find a courtyard, yet it is charming and “Disneyesque.” The view from the highest window is lush with foliage, but the rooftops below do nothing to support the sense of remoteness conveyed in the novel and films. The ceilings aren’t terribly high; it’s cozy, not crypt-like. I’ve read that Stoker never visited Transylvania. And I know Bran Castle has no credible, grounded connection to the Dracula legend. 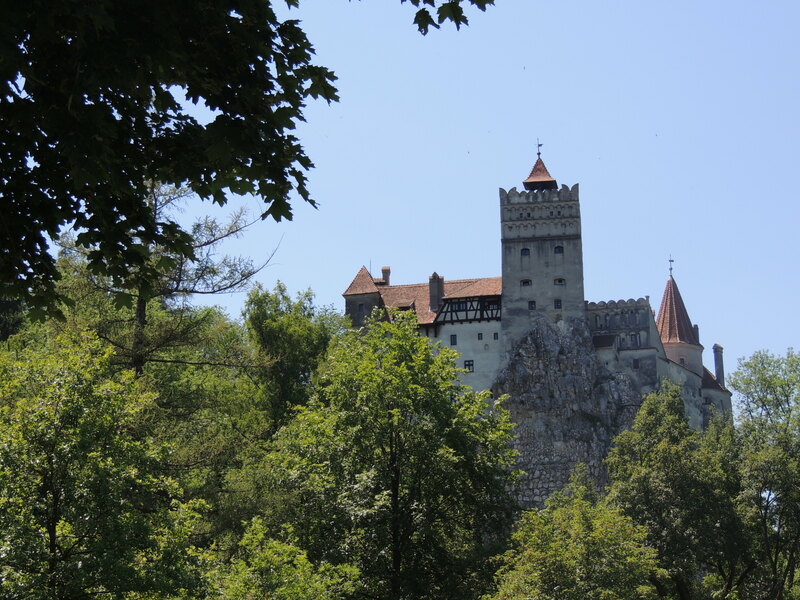 It is said that Vlad (The Impaler) Tepes might have stayed at Bran Castle once, but even that is speculation, as is Stoker having used him for character inspiration, for the matter. And though I didn’t expect authentic 19th-Century Transylvania, I couldn’t help but include my wide-eyed, romanticized idea of it when I packed my bags for Romania. If a piece of my heart died that day—left behind on the tourist-trampled streets of Bran—at least it wasn’t dead for long. Chris Campeau is a writer of short fiction and creative nonfiction. 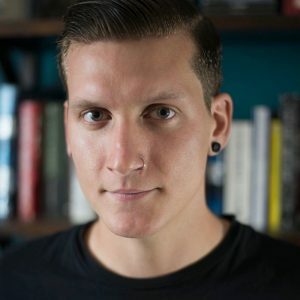 His work has appeared in publications such as Deadman’s Tome, Polar Borealis, and The Furious Gazelle Magazine, and his first children’s book, The Vampire Who Had No Fangs, is available via Amazon. He studied writing in Ottawa, Canada, where he resides with his wife and two cats and works as a B2B copywriter. Creepshow 2 on VHS is his most prized possession.